The Elan Valley located in Mid Wales is a mosaic of moorland, woodland and reservoirs held back by grand Victorian dams. Brian and Sorcha Lewis are third generation tenants who live at Troedrhiwdrain Farm with their two small children. Troedrhiwdraen (meaning ‘at the foot of the thorny bank’), is a 580ha typical family upland farm – owned by the Welsh Water Elan Valley Trust near Rhayader. 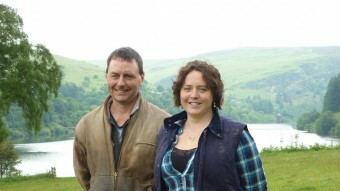 Over the last 10 years Brian and Sorcha have developed the productivity of the farm, whilst successfully retaining and incorporating many important habitats, including hay meadows, ffridd and rhos pasture. Due to its location within the water catchment for the water supply to Birmingham, the farm has been managed as low impact for generations, with no inorganic fertilization of the ground – just sheep or cattle manure. 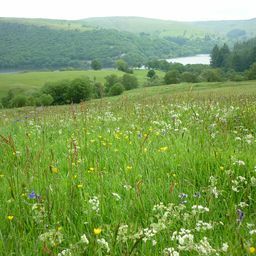 This careful management, along with the range of habitats, means the farm hosts a wealth of rare plants including various species of orchid, round leaved sundews, wood bitter vetch, mountain pansy and globe flowers. 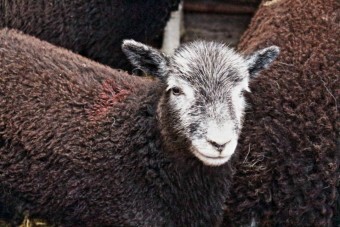 A number of traditional breeds are used on the farm including Badger faced Welsh Mountain, Welsh Mountain and Herdwick sheep. Consideration has also been given to introduce cattle as a management tool for the rhos pasture to further benefit a number of species; although stocking around the reservoir edges may be restricted, discussions are underway with Welsh Water to look for solutions. One valuable and increasingly rare habitat found on the farm are the traditional hay meadows, 97% of which have been lost across England and Wales since the 1930’s, these help produce quality slow grown lambs fed on the herb rich swards. Sorcha is currently looking at ways of marketing the farm produce with a conservation certification and they recognise the value of promoting grass fed, locally sourced and traceable meat products. Brian and Sorcha manage the farm with nature in mind, creating habitats to benefit nature as well as the farm business; they have increased the area of Ffridd found around the farm. 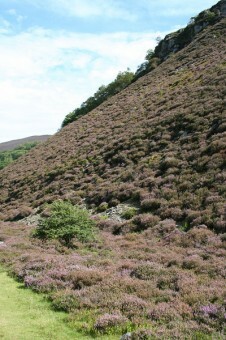 Ffridd is a habitat found on the land between the enclosed fields and the open hill, typically steeply sloping and dominated by scrub, these areas are difficult to manage but provide an important wildlife habitat. The Ffridd areas around Troedrhiwdrain are home to populations of declining bird species including ring ouzel, red grouse and cuckoo. They are also home to the Welsh clearwing moth which has been identified as a biodiversity priority by the Welsh Government, birch trees are being planted at Troedrhiwdrain to provide suitable habitat for this important population of these wasp like, day flying moths. As well as maintaining and enhancing the existing habitats new habitats have been added including a pond which was created in 2005 which has already attracted priority species including water vole and otter. Troedrhiwdrain is a fine example of High Nature Value (HNV) farming and highlights the importance of grazing for creating and maintaining valuable wildlife habitats in Wales. Agri-environment schemes can be an important means of support for this type of environmentally friendly farming and Troedrhiwdrain is currently included in the Tir Gofal agri-environment scheme. Sorcha and Brian are hoping to enter the new scheme Glastir Advanced, when their Tir Gofal scheme ends this year, so they can continue their excellent work and receive just reward for providing society with a wide range of environmental benefits in return for their publically funded agri-environment scheme payments.